DMG Productions educates on the latest advances in data transmission. 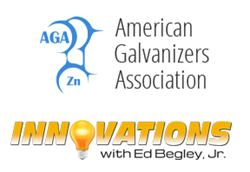 Innovations with Ed Begley Jr., announced today that it will feature American Galvanizers Association (AGA) Inc. in an upcoming episode, airing third quarter 2016 via Discovery Channel. Dates and show times TBA. The AGA is a non-profit trade association dedicated to serving the needs of after-fabrication galvanizers, fabricators, architects, specifiers, and engineers. The AGA provides technical support on today's innovative applications and state-of-the-art technological developments in hot-dip galvanizing for corrosion control. This segment will take a behind-the-scenes look at the world of galvanizing, its history, and how it has transformed into the art it is today. In addition to exploring the AGA, the Innovations show will also educate on the special skill and efforts of galvanizers, fabricators, architects, engineers, contractors, and all other parties as they complete projects, and how it is able to remain durable, beautiful, and maintenance-free for generations to come. ”The AGA is very excited about the opportunity to display our industry and innovation on the Innovations TV Series. Although hot-dip galvanizing has been around for hundreds of years, the use of galvanized steel continues to evolve and expand in North America. There are still many in the specification community and general public who are unaware of how integral galvanized steel is in their everyday lives and activities, but this segment has the potential to really open their eyes to the myriad uses of hot-dip galvanized steel,” said AGA Marketing Director Melissa Lindsley. Audiences will also learn about the AGA’s continuing education program for architects and engineers called the Galvanize It! Series, which is approved for continuing education credits for both architects (LUs) and engineers (PDHs). The American Galvanizers Association (AGA), headquartered in Centennial, Colo., is a not-for-profit trade association dedicated to the North American hot-dip galvanizing industry. Serving the needs of specifiers, architects, engineers, contractors, and fabricators since 1935, the AGA provides information on the most innovative applications and state-of-the-art technological developments in hot-dip galvanizing for corrosion protection. Created to educate and train in the specification and use of hot-dip galvanized steel, the AGA maintains a large technical library, distributes numerous industry publications, offers free educational seminars, and provides free technical support to the specifying community. For more information, visit http://www.galvanizeit.org or contact Marketing Director Melissa Lindsley at 720-361-4481 or via email at mlindsley(at)galvanizeit(dot)org. For more information visit http://www.InnovationsTelevision.com or contact Eric Buckley at (866) 496-4065 x 817 or via email at eric(at)InnovationsTelevision(dot)com.